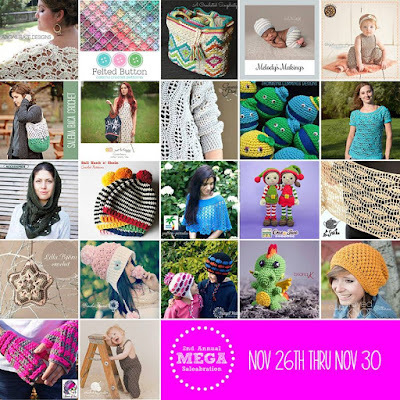 Ball Hank n' Skein: 2nd Annual MEGA SaleABration!!! I'm so excited to be participating in this year's 2nd Annual MEGA SaleABration! This year we have over 20 designers giving deep discounts from 25% to 60% off all patterns in our Ravelry shops. Please head on over to A Crocheted Simplicity to find out all about it and how to enter into our Grand Prize $100 craft store gift certificate.